Neustar’s IP Intelligence data family, which includes IP GeoPoint and IP Reputation, is the authoritative source of IP decisioning data on 99.99%* of routable IP addresses worldwide. 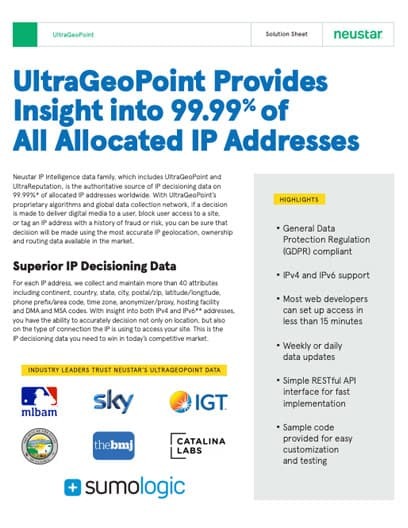 With IP GeoPoint’s proprietary algorithms and global data collection network, if a decision is made to deliver digital media to a user, block user access to a site, or tag an IP address with a history of fraud or risk, you can be sure that decision will be made using the most accurate IP geolocation, ownership and routing data available in the market. For each IP address, we collect and maintain more than 40 attributes including continent, country, state, city, postal/zip, latitude/longitude, phone prefix/area code, time zone, anonymizer/proxy, hosting facility and DMA and MSA codes. With insight into both IPv4 and IPv6** addresses, you have the ability to accurately decision not only on location, but also on the type of connection the IP is using to access your site. This is the IP decisioning data you need to win in today’s competitive market. Our IP GeoPoint data packages have been created to make it easy for you to select the foundational location decisioning data you need – while giving you an easy way to add insight as your data needs change. With over 40 data fields, and global insight into both IPv4 and IPv6** addresses, look no further than Neustar IP GeoPoint data to support your threat intelligence, cybersecurity, content distribution, fraud prevention, geo-fencing and customer experience applications. This package provides you with basic, yet powerful, decisioning data at the county level. In addition, we provide you with a powerful and unique “confidence factor” that reflects a relative measure of certainty that the user is in the location identified in the country field. The possible values range from 0 (null) to 99. The higher the value, the greater the likelihood that the user is in the assigned country. The Location Advanced data package provides you with country level data fields included in the Location Basics package, plus state (with state confidence factor), postal code (with postal code confidence factor), lat/lon, time zone, connection type, line speed and routing type. We also include DMA and MSA data for the most comprehensive location data available. Knowing how a device is attempting to access your website or corporate resources, and if it is using a risky internet connection, is critical to the success of your business. If the device is connecting via an anonymous proxy, you may want to flag the IP address or block access outright. The Proxy Details package provides you with the rich connection data you need to protect your business including hosting facility, anonymizer and proxy details (type, level, proxy last detected) and IP routing type. Understanding what organization is behind an IP address can be critical to your success from both a security and marketing perspective. With the decisioning data fields included in the Org Details package, you can parse incoming IP traffic not only by location but also by domain so that you can ensure your message or offer gets to the correct customer. With this data you can ensure an offer developed for a specific organization (e.g. university) is delivered to the students at that university. Conversely, you can block specific organizations or type of organization from accessing your sensitive data or proprietary resources. Neustar Custom GeoPoint enriches IP address intelligence data beyond the capabilities of standard IP-geolocation data used in fraud prevention, threat intelligence, streaming media distribution and digital marketing platforms. Both the on-premise and Neustar hosted solutions feature a RESTful API interface. Data can be provided in either daily or weekly updates. As opposed to competitors who merely scrape registry data, we collect IP data from numerous countries across 5 continents and incorporate trusted partner data from countries with mobile networks. Updates to our data are made around the clock. The amount of data collected, the variety of sources we access, and the data “freshness” ensures that the IP decisioning data from Neustar is as current and accurate as possible. Our patented proprietary technologies and algorithms ensure complete and accurate data collection and mapping on every routable IP address across the globe. By augmenting our IP geolocation data with insights derived from our partners and customers, we produce superior, granular city-level data down to postal codes (US). This granularity and insight provides you with tremendous ruleset flexibility. We provide IP insights on more than 40 attributes – including DMA, city, state, or country of origin; whether it’s routed through an anonymous proxy; and its risk and reputation – so you get the critical information you need to determine if an IP is a potential threat. In addition to deep insight into IPv4, we also provide geolocation data on IPv6** routable addresses. Automation alone cannot map the Internet - deep understanding by experts who speak the language of IP Intelligence is necessary. We complement our advanced technology with a team of experts in the field who know how to decode patterns and match corresponding data, providing you with the highest quality decisioning data available. Our proven processes, and the reliability of our closed loop continuous feedback methodology is second to none. By using our unique feedback process, we receive direct feedback from our customers about any changes they are seeing regarding an IP address, its attributes or connection type. These updates are continuously added to our IP GeoPoint database providing you with even deeper and more accurate insight into routable IP addresses worldwide.